This otherworldly looking fruit is part of the cactus family. They are native to southern Mexico and Central America but are now cultivated heavily in Asia. 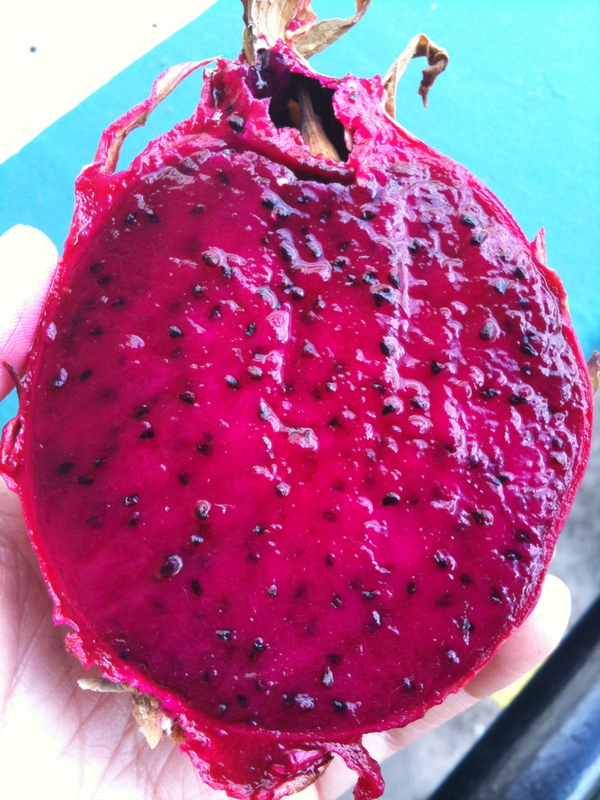 Three different varieties are being grown in Hawaii: red-skinned with white flesh, red-skinned with dark magenta flesh, and the smaller yellow skinned with white or yellow flesh (most folks call this one Pitaya, it’s original South American name). The red-skinned fruits are usually palm sized and have a heft to them, as the flesh is full of thirst quenching moisture. It has a delicate flavor, very much mild side – which is always surprising given its outrageous appearance. It’s remarkably colored and leafy skin is leather like. Inside, its flesh is like a kiwi – a constellation of numerous tiny black seeds scattered throughout juicy melon like flesh. These seeds are eaten, like with kiwi. Dragon fruits contain vitamin C, phosphorous and calcium. They are also a good source of fiber and very low calorie. These amazing looking fruit grow on long green cactus stems. They are of the Night Blooming Cereus family and are almost identical to the long hedge growing along Punahou’s black rock wall, though Punahou’s is a decorative variety as opposed to the heavily fruiting ones that are being grown for fruit. – Most folks just cut the fruit lengthwise and scoop out the flesh with a spoon! 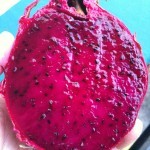 Avoid dragon fruit with too many brown bruises and really dried looking stem (piko like thing at the top of the fruit). Local dragon fruit is not only fresher, but possibly safer too — sometimes dragon fruit grown on large scale farms in other countries are heavily sprayed and come through long transportation routes. 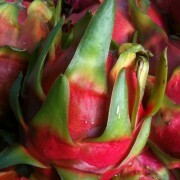 Dragon Fruit does not continue to ripen after it is harvested but its flavor and quality deteriorates rather quickly, so enjoy soon. It can be stored in the veggie bin of your refrigerator for up to a week. It can also be peeled, cut and frozen for up to three months.